Unlike media such as magnetic tape, the WORM (Write Once Read Many) BD-R physically prevents overwriting. With its long-term storage ability, the BD-R eliminates security risks because data migration is unnecessary. Blu-ray Disc format is easily extendable (future-proof) as it includes support for multi-layer discs. This allows the storage capacity to increase the current 100-128GB/disc capacity to 200GB in the near future simply by adding more layers to the discs. Optical media has industry standard formats; ISO 9660 and UDF (Universal Disk Format) which are supported on every operating system including Windows, Linux, UNIX and MAC OS X. This avoids the direct need for additional client software as data can still be read in a standard drive in a standard PC, yielding complete vendor Independence. The Blu-ray Disc™ is the de facto standard for large-capacity optical discs, and is supported by about 170 major corporations, assuring long-term readability. Blu-ray technology offers random access to any file on Blu-ray Discs. Unlike with Hard Disk storage, media is not spinning and less subject to physical damage, viruses, etc. Tape drives provide sequential access and recovery times are slow as the tape needs to spool to find the file. Off-line management of very old information is not possible with magnetic hard disks as they can’t be safely removed and stored long-term outside of the archive. Tape can be removed and stored off-line, however, tape needs periodic re-tensing to prevent tape adhering together and is like hard disk vulnerable to (electro) magnetic radiation. Blu-ray Discs can be safely removed and stored off-line, offering unlimited archive storage capacity. While maintaining all benefits of a standardized format, Blu-ray technology is available as a best-of- breed hybrid solution technology for organizations. Combining the removability and longevity of Blu-ray with direct access and speed of hard disk yields easy to deploy and maintain appliance type solutions. Cloud storage has some advantages, but many companies choose for a mixed model to implement a secure, physical archive in place which is less susceptible to outages, network bandwidth and privacy breaches. Blu-ray technology offers a sustainable archiving technology. Blu-ray media consume zero power when not being accessed, reducing power consumption, air conditioning needs and CO2 emission. As there is no need for frequent data migrations, less waste products will be generated by having to replace devices. Due to its advanced media lifetime of 50+ years , standardized format and removability, Blu-ray technology offers the possibility to build long-term infinite off-line media archives. Compared to magnetic tape and HDD, it is less likely to be affected by humidity, temperature and light, and resists changes over time. Unlike magnetic tape and HDDs, there is no contact between the optical pickup (OPU) and the disc, so it maintains excellent durability even after repeated reading and writing. 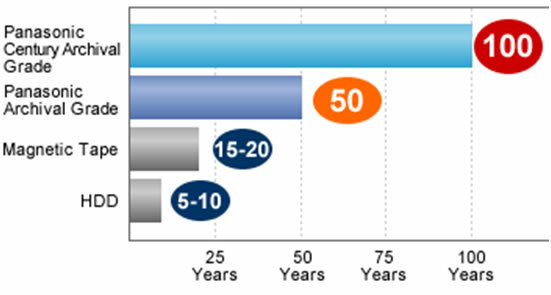 Panasonic Blu-ray™ discs have an archival life of 50 or 100 years, in contrast to an HDD’s 5 to 10-year and magnetic tape’s 15-20-year archival life. This allows data to be stored for longer periods of time.